Well I didn't get to go to the Brownies Halloween party this year, it was early and someone's birthday party clashed with it!.....sooooh I didn't get to dress up....aw!! 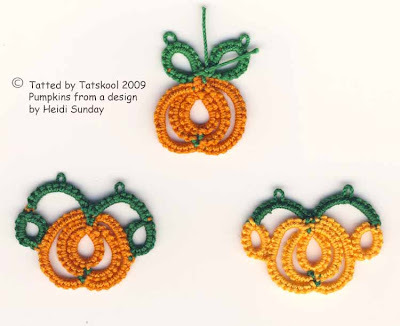 But with a bit of luck I am going to spend Halloween with a new tatting friend and get to do exciting things. I did tat Halloweeny things. Having been inspired by others it was Heidi Sunday's Pumpkins on a Vine. My first attempts in Flora 10 and 20. I did find the pattern tricky at first. 3 Pumpkins, then 4...the lines got longer...up to 6 pumpkins...now what shall I do with them....mmmmm! I have an idea! Time to play around a little and make some individual pumpkins. All in Flora 10 and measuring about and inch and a half. the top one with two leaves and the bottom two playing with different colors for the side rings..are they leaves or miniature pumpkins?? ....into this, with the help also of some holographic glitter. So aren't you all dying to know what I did with my string of Pumpkins????? 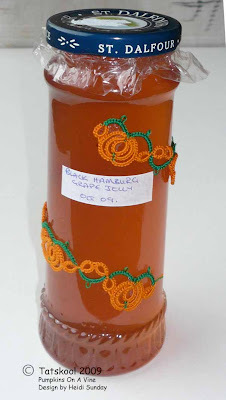 Well...I had a really pretty tall jar filled only a week or so ago with Grape jelly made by my very special House Elf from his very special Black Hamburg grapes in his very special greenhouse...ripened in this especially awful summer!! It was so obvious that it needed pumpkins wrapping round it...of course it should have been Pumpkin jam! and it should have had a much prettier label....but you can't have everything...this is of course for a special friend...with the very special card. 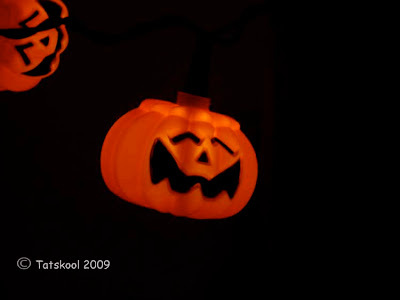 HAPPY HALLOWEEN to all my blogging friends! you are all special, very special!! 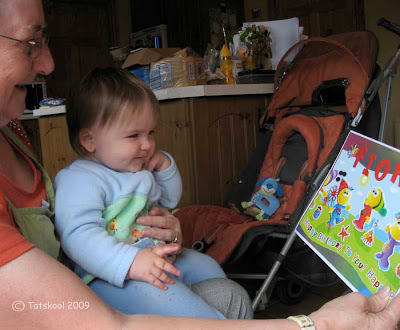 Lots of comments came in about the gorgeous grandbaby and the garden visit. 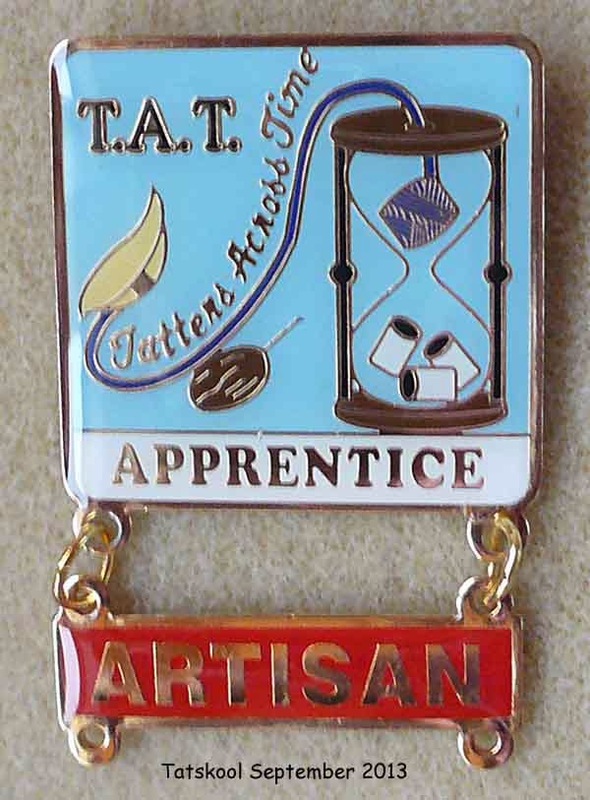 You wanted to know more and see more...if this is you then pop over to my other blog which now deals with most of the boring non tatting stuff!! to read about the garden. 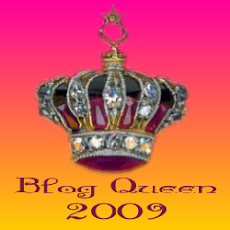 Do please leave a comment and become a follower, that blog feels very lonely and isolated!! It was grandbaby's first birthday on friday and his party on saturday. I can't believe that a whole year has gone by since we were eagerly awaiting news. We drove up on thursday with his big bag of presents...mainly clothes..including a gorgeous winter coat with fur trimmed hood...for the weather he is expecting! I got the brightest...baby appealing wrapping paper that I could find..in the hope that a baby would be tempted to look inside...how wrong can you be! A sudden inspiration led me to make some of it into a huge birthday card...that must surely appeal to a baby...and a couple of hours later it was finished. 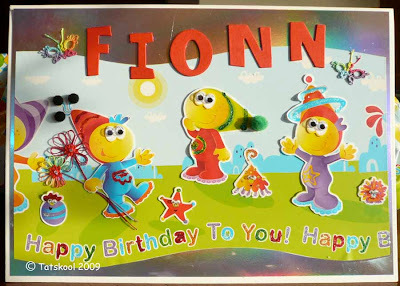 ...part of the design mounted on holographic card.....more copies of the little people were glued on top to create a 3D decoupage effect. 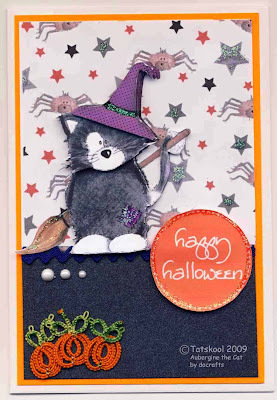 Googley eyes on them and on the tiny critters....lots of glitter...and some pompoms to make it a touchy feelie card. Some tatted flowers and butterflies sneaked in there too....can't have a card for him without tatting. If only you could see how it sparkled. His mum was most impressed...and he......LOVED it! 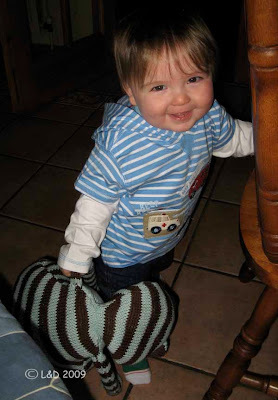 His little fingers went straight for the green pompom and he tried his hardest to pull it off.....but it held fast!! until he managed to separate the bit it was glued on to from the next layer in the decoupage underneath!! Little blighter...never underestimate a baby! 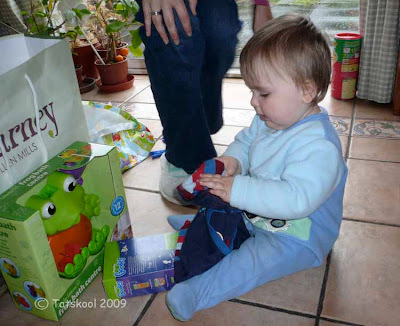 The other parcels he had no time for, he brushed them aside on to the floor!! 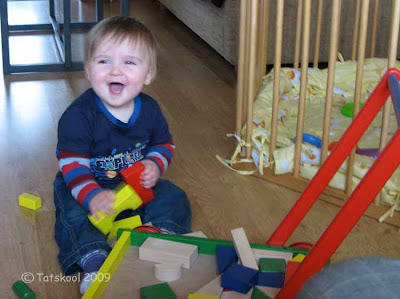 But he did like what was inside when his mum helped him. He even like his new t shirt especially the stripes. 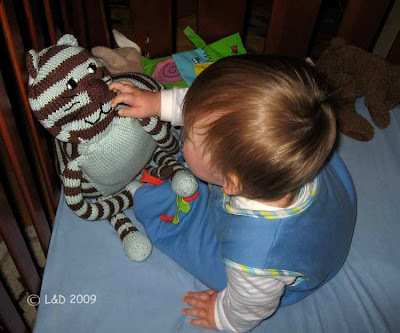 His mum had knitted him a cat...can't help but like what mum makes for you. His happiness was as usual overflowing. I have yet to see him in bad form. He is walking round the furniture and crawling like a racing car! 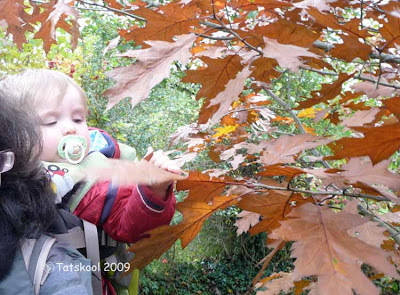 ...I did tell him that these huge Oak Leaves were grandmas Rusty Red but he wasn't impressed! 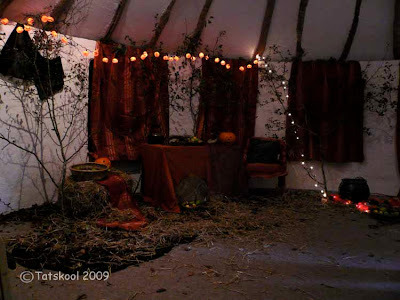 Inside the Crannog they were preparing for their Halloween event...when a visiting witch would be telling stories. The decor was lovely. The pumpkin lights were gorgeous. 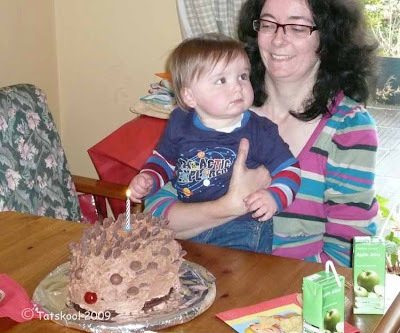 His birthday party was great, he loved his hedgehog cake that his mum made....probably his first piece of sweet cake. His favourite finger foods include avocado and asparagas! Now I am trying to get back to reality...before my Halloween treat at the weekend!! 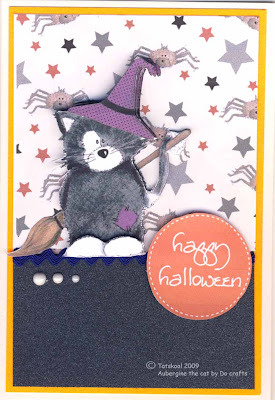 I will show you what I have been tatting for Halloween....not a lot really!! Mustn't overtax you yet tho. 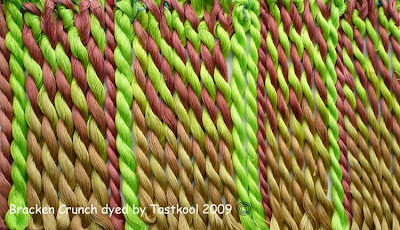 If you follow my blog you will know that I can't just tat one of a pattern...I always think...what would it look like in another colour! and another and another! Well it's getting to be just the same with threads. With the Hot Chocolate Family I have been working with only two colours and all the intermediate shades between them, knowing that the results will be harmonious. 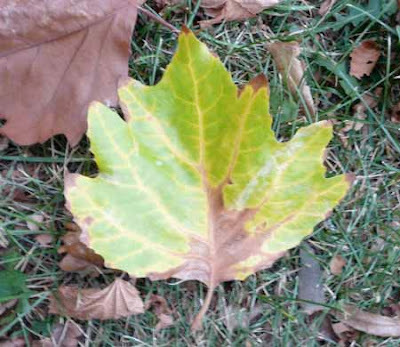 ChocoLime really grew on me...but as I looked at more and more leaves...I began to wonder what it would look like if I changed the chocolate to a more rusty red colour. 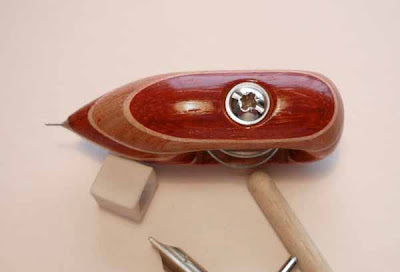 ...yet another trusty Hearts Desire...this looks beautiful in every thread. ....not a lot of difference you say. Well it's SUBTLE!! Do I like ChocoLime's cousin Rusty....I love it!.....like ChocoLime has beautiful intermediate shades that gave rise to Antique Bronze I can see that I will have to experiment with the new fellas intermediates in another 'mousse' cos I see some lovely ginger shades in there....more work! 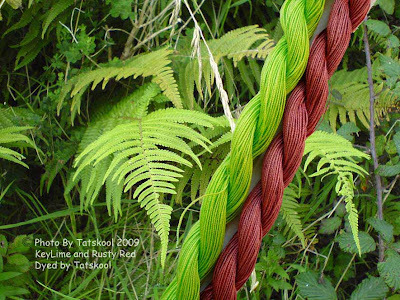 Well as the usefulness of these threads seems to be particularly in tatting leaves, (tho it would look nice in lots of other things) the question is does the new fella look like a leaf. Looking good...a bit of yellow in there wouldn't go amiss but that's for another day. 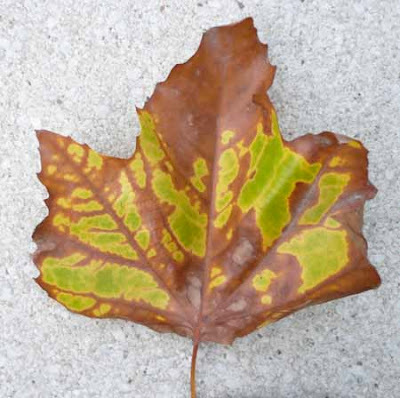 ...this one uses RustyRed for the veins. BUT I can't keep on calling it ChocoLime's cousin Rusty...it needs a name of it's own...but what does it really look like. 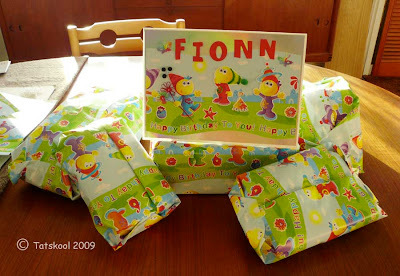 When we were up in the north west of Ireland a couple of weeks ago for my birthday, the answer shouted out at me. We were driving along for miles and miles with fields and hedgerows of.....on either side and I suddenly thought..that looks so familiar... the colour combo was exactly spot on. I should have shouted STOP I want to take a photograph. So what was it that I saw. 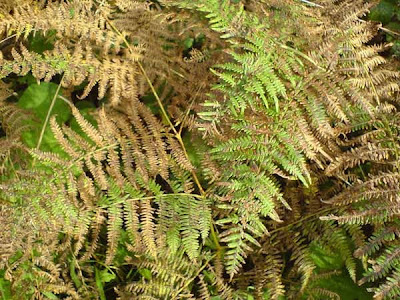 It was Bracken, loads and loads of ferny fronds of Bracken in all the colours from fresh lime green to the dried up rusty red fronds. 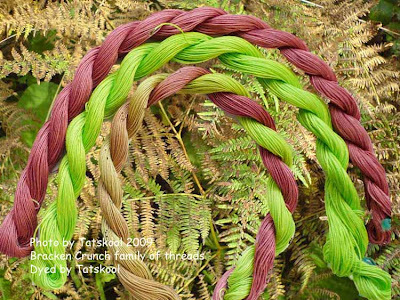 Do you remember how it feels to walk on dried Bracken, the crunch that it makes under your feet? 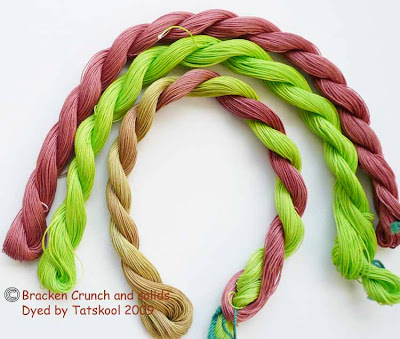 So ChocoLime's cousin got his name BRACKEN CRUNCH...do you think it suits him?? 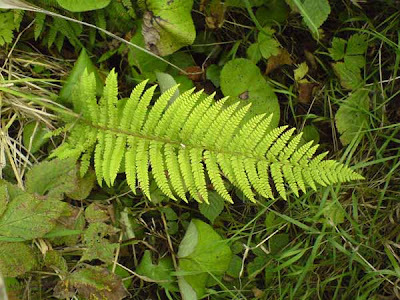 Back home I spotted Bracken near my house, not nearly as dramatic but worth a photo with my phone (ain't phones marvellous!). Pretty cool resemblance don't you think. 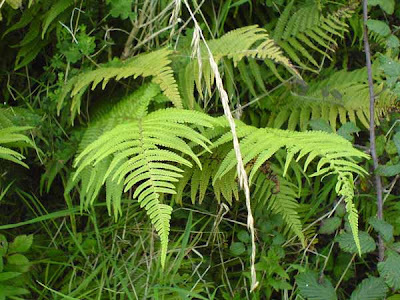 This is what Bracken Crunch looks like en masse. ...and it's it's own little family group. I LOVE to see what you have made with my threads. 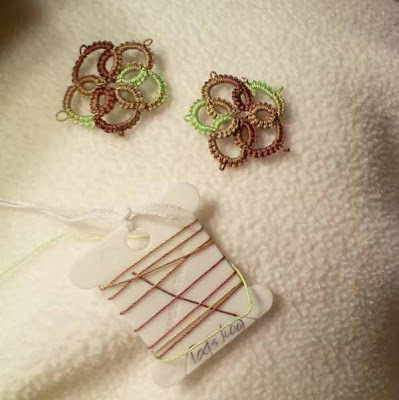 Viv of Viv's Tatting Quest made these little motifs for earrings with a sample of ChocoLime that I sent her. She has such nice things to say about it.....makes my heart sing! 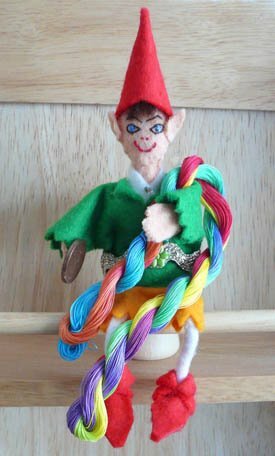 Anybody who is interested in reading about my non tatting antics might like to have a read on my other blog...which needs to be renamed! I have been finding packages of books in my porch! There is always room in my life for another book and if it's a tatting book then it's even more welcome. My packages came from Malaysia, Ohio and Ontario....without the internet how would I ever have know about these self published books? 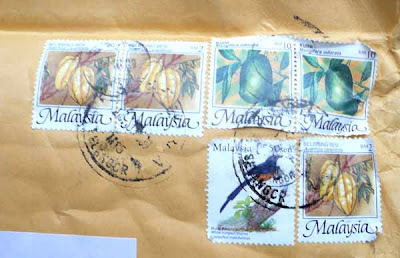 Look at the beautiful stamps from Malaysia..... more delicious fruits that I have never heard of, I wonder are they edible. The mangosteens that I told you about in the last post were a disappointment.It is the end of the season and they were past their best. 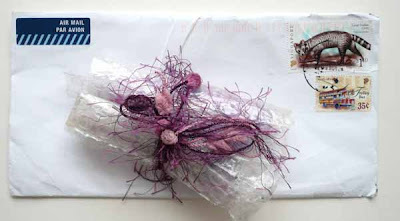 ...inside was a bundle of books....Jon Yusoff's Tatting with Rings. 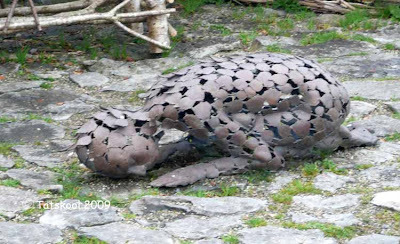 ....for my friends all fans of Jon's work. We had these on order since before her book was even published. As soon as I told them about her upcoming new book, I was asked.."Have you ordered it for us?" See all the little bags of rings specially packaged by Jon. 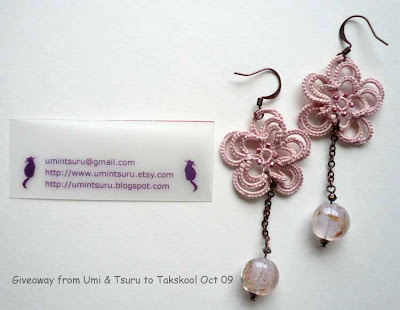 I was so glad that I had ordered them as they are so different from my stash of rings. 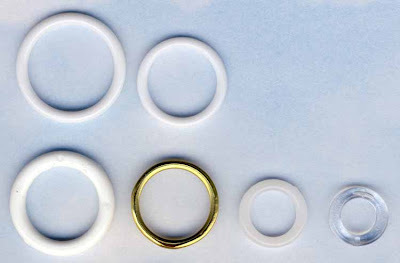 I have a good selection of rings both plastic and brass but nothing to equal these delicate rings. Next book to arrive was from Ohio, Rozella Linden AKA Ruth Perry's Celtic Leaves and Flowers. 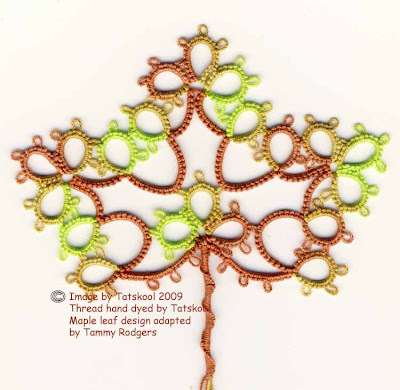 I bought this primarily for the Celtic Maple Leaf as I was into tatting leaves, but there are many more leaf and flower patterns to tempt me. Last to arrive in a record time of 4 days over a weekend at that was Sharon Brigg's new book Marvellous Motifs...a collection of motifs to stand alone or be joined into mats or shawls. 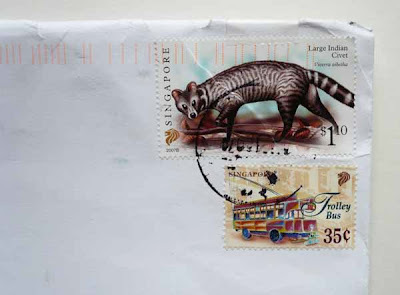 Such a lot of work has gone into the design of these motifs and you are bound to see something you would like. Sharon is struggling to teach me to be a designer in the Design Tat course! hmmm! 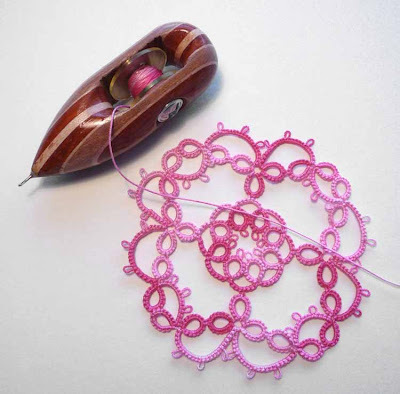 OK, so you spotted that there is another book in this group, 24 Snowflakes in Tatting by Lene Bjorn. I got this book just before last Christmas and I have challenged myself to tat as many of these snowflakes in order as I can before Christmas. One done 23 to go! Such a varied group of snowflakes will be a delight. I don't enter a lot of giveaways...partly because I often feel that the prize should go to someone else! but often because I know that I am not going to win anyway,(ok sour grapes I know). There could be two names in a hat and mine would still be drawn last...that's the story of my life. Don't you wonder why some people always win and some never do? How can this be when the frequent winners are no where near the drawing.There really need to be serious research done!! I have tried positive thinking, once I looked at my raffle ticket and pronounced that it would be the winner and blow me but it was! !..But that never worked again! So imagine my surprise when I won Ladytat's giveaway. Even funnier was that I was No 13 to comment! It was waiting for me when I got back from my Birthday trip...a lovely surprise to come home to....couldn't wait to open it. 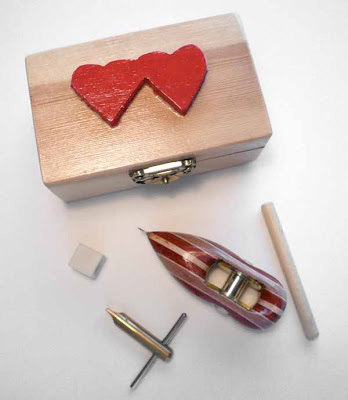 It's a beautiful shuttle made of laminated wood...not sure which woods they are and comes in it's own sweet little box, with a screw driver, a dowel for winding and a hook protector...it's got a very neat small hook....but no instructions for a 'dummy'! The wood calls for a much closer look. Well now what better thing to tat with it than Ladytats very own design! 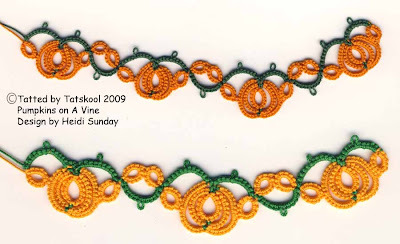 This is Meandering Path that she has designed in Sharon Brigg's Design Tat class. 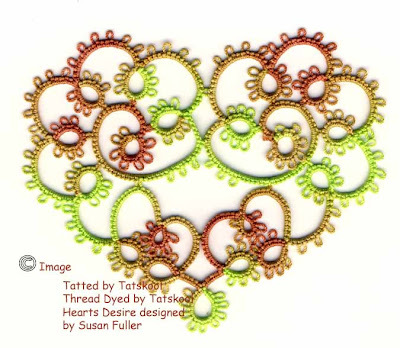 A great class that I too am taking...and have got way behind...but I have started Test Tatting....instructions are on her patterns blog. Now I know it looks as if I tatted it using my new shuttle....but that's a bit of a cheat!! Thanks so much Ladytats for this giveaway. 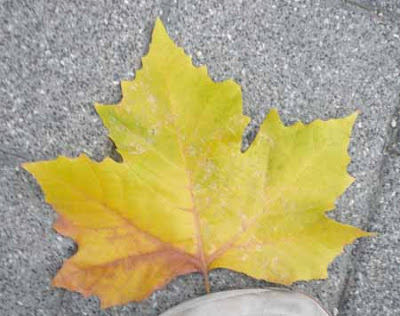 Let's take a closer look at the motif. This was my second attempt...not that there was anything wrong with the first...it just wasn't in a pretty colour. This is my hand dyed Raspberry Sorbet in size 30. Now isn't that a pretty design? I would have liked to have tatted it in two colours but wanted to stay faithful to her original design without altering it. 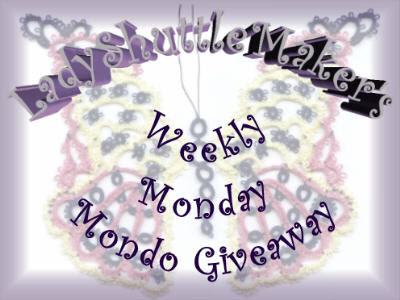 Oh my goodness the tatting world is awash with gorgeous giveaways. 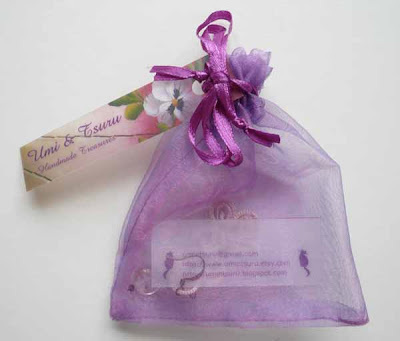 ....and just today we have Ambitaterous's Knot-Tea fun .giveaway. IsDihara from Ambitaterous is the World Famous instigator of Tatting Tea Tuesday. Now where would we all be without that to brighten what today has been an awful tuesday...weather wise that is!! Our Indian Summer has broken and we now have torrential rain. So off to tat tonight.....am making a......!!!! OOOPS!! 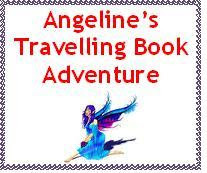 I nearly forgot to say that I have been awarded the Bella Sinclair Award by Carol of Carol's Little Treasures. 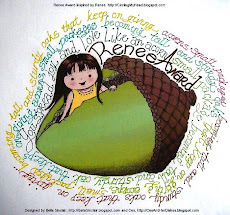 The Bella Sinclair award is for Art Inspiration, Friendship Sisterhood, Sharing, and Caring. 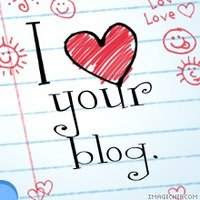 Thank you so much Carol, I am honoured that you think so much of my Blog. I would like to pass this on to LadyShuttlemaker and IsDihara but Carol has beaten me to the last two but I would like them to have the award from me too.